At Pan Am, when I was flying the old 707, the 747 was delivered to the airline. I was too “junior” on the seniority list to get a slot on it. After several years of waiting, I started 747 ground school training with great excitement. The first day, one of the instructors told us about the windshield on the 747. The windshield is huge. Ordinary glass was not strong enough. To provide the necessary strength, engineers used a thick slab of structural glass. That was strong, but it had a rough surface, too rough to see through. In order to make it smooth enough to see through it, the rough structural glass was coated with a thin layer of optical glass. The optical glass provided the smoothness necessary to see through the windshield, and the rough structural glass provided the necessary strength. 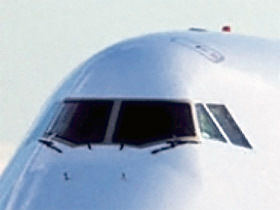 The only problem was, that — occasionally — in the cold air at cruise altitude, the adhesive bonding the optical glass to the structural glass would give way, and the optical glass would come loose and fly off. They explained that if it did, the other pilot would still be able to see through his or her windshield, or if both windshields were to have the same problem (which never had happened) then the plane could be landed automatically on autopilot. Once I realized that that was the worst thing possible, the anticipatory anxiety about it went away. Anxiety is always about things getting worse. If we get a good handle of what “worse” really could be, and accept it, then anxiety about it often goes away.